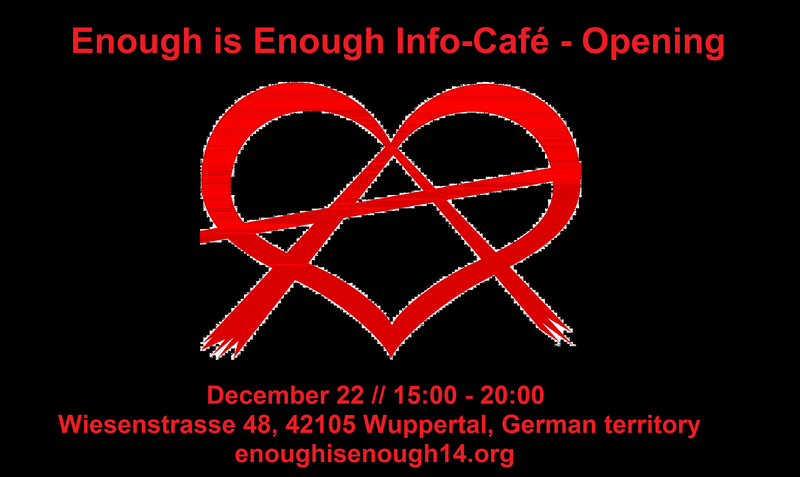 We would like to invite you to the opening of the Enough is Enough Info-Café in Wuppertal (German territory). Save the date: December 22 from 15.00 until 20:00 in the Wiesenstrasse 48 in Wuppertal. The Nordstadt district of Wuppertal (German territory) is changing! A sign for movement is a lively and changing neighbourhood. The Nordstadt district and its residents have gone through many changes over the years and not all of them were positiv. But one thing didn’t change: The Nordstadt is a special neighbourhood with special people. With the Enough is Enough Info-Café our neighbourhood will be even more colorful, solidary and restive against capitalism and all of its inhuman consequences. Not everything is ready yet, but when are things really finished? We cannot wait any longer and absolutely want to open our doors this year for all of you. On December 22 you are invited to come to Wiesenstrasse 48 in Wuppertal (German territory) and have a look. We open at 15:00 (03:00pm). Food and some of the drinks will be offered for a donation and there will be even a small program. Between 17:00 and 19:00 the first of our open cultural stages will take place, hopefully this first open stage will be followed by many others. You can expect a colorful program, starting in January in the Info-Café in the Nordstadt in Wuppertal. The cultural stage, screening events, Info events, a DIY and upcycling round will take place every month, so we can learn to know each other better and so we can learn from each other. Of course we are also open for your ideas and wishes. We can realize them together. We thank all of you who supported us in the past months. Without your help and solidarity (Renovating, organizing stuff, donating etc. etc.) this would not have been possible. For a solidary neighbourhood and a solidary world! Enough is Enough collective, December 10, 2018. Next post: Yellow fever: long live the revolutionary mob! Welcome to the Enough is Enough Info-Café: Opening hours 2018 – Enough is Enough!